So we'll skip the details of yesterday, my worst day in London yet. They included Quinton breaking a lamp and me locking us out of the flat, which resulted in me hauling two upset young boys onto the bus and tube to get Dan's keys from him down town, in place of going to Priory Park to play. Good grief. Today, however, was a BIG day for the family. 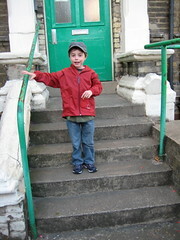 Elliot started kindergarten at North London Rudolf Steiner. He needed to bring a vegetable for the soup they were making for snack. When I told him this two days ago it brought tears, because, of course, he does not like soup. We worked through it. Dan stayed home for the event, and we all walked Elliot to school. What a star he was. We arrived, took the obligatory pictures, he got his "inside" slipper shoes on, and off he went. Hugs, a smile, and a "see you later." My big boy. Q & I picked him up at the end of the day in the garden, joining in for the goodbye ring time, which is circle time. He was still smiles, adorable in his curls and wellies, and informed me quite proudly...."Hey mom - guess what?!" "What?" "I like soup now!" "Wow - did you eat it?!" "Yes! It was vegetable soup and I liked it!" "Well, I bet you feel proud, well done." Emma informed me his day was really....British accent here......"quite fab." What an experience this all is. Aside from the ingestion of homemade vegetable soup, we got more good news. They have a place for Quinton in Emma's class. Woo-hoo! His first day will be Monday. What WILL I do with four mornings to myself? Breathe, possibly? Buy one of those adorable sweater dresses in Crouch End I've been eyeing up? Find a yoga studio? Find my sane mind and trade it in for the mad one occupying my head? Tomorrow Quinton & I are off to buy a stroller. This will make a huge improvement in our relationship. Elliot has his first Wednesday of all-day school. Fruit tomorrow for snack - he whispered in my ear tonight that he's taking a banana.